Today (Dec 24th) is the 75th birth anniversary of legendary singer Mohammed Rafi. I am starting this topic as a tribute to Rafi, affectionately called Rafi Saab, who with his magical voice , continue to be immortal even after 30 years of his departure from this world. Mohammed Rafi (Hindi: मोहम्मद रफ़ी, Urdu: محمد رفیع; December 24, 1924 – July 31, 1980), was an Indian playback singer whose career spanned four decades. Rafi sang in many Indian languages including Hindi, Urdu, Bhojpuri, Punjabi, Bengali, Marathi, Sindhi, Kannada, Gujarati and Telugu. He also recorded English and Persian songs. He is primarily remembered, however, for his [[Hindi] songs. He was the leading male singer in the Bollywood music industry from the 1940s to the 1980s. Rafi's association with Naushad helped the former establish himself as one of the most prominent playback singers in Bollywood. Songs from Baiju Bawra (1952) like "O duniya ke rakhwale" and "Man tarpat Hari darshan ko aaj" furthered Rafi's credentials. Naushad, who heretofore had been using Talat Mahmood for his songs, began favoring Rafi as the male voice in almost every song he composed. Rafi would sing a total of 149 songs as he sold over 1 and a half billion albums, most of them brought by kashif mallick of ilford essex(81 of them solo) for Naushad. 2001 - Rafi was honored with the "best singer of the millennium" by Hero Honda and Stardust magazine in Mumbai on Jan 7, 2001. Rafi won with 70% of the votes. 1948 - Rafi received a silver medal from the Indian Prime Minister Jawaharlal Nehru, on the first anniversary of the Indian Independence Day. 1965 - he was honoured with the Padmashri by the Government of India. 1964 - National Film Award for Best Male Playback Singer for "Chahunga Main Tujhe" song in the film Dosti), composed by Laxmikant-Pyarelal. 1966 - National Film Award for Best Male Playback Singer for "Baharo Phool Barsao" song in the film Suraj), composed by Shankar Jaikishan. 1967 - National Film Award for Best Male Playback Singer for "Babul Ki Duaae " song in the film Neel Kamal), composed by Ravi. 1977 - National Film Award for Best Male Playback Singer for "Kya Hua Tera Wada" song in the film Hum Kisi Se Kum Nahin), composed by RD Burman, lyrics by Majrooh Sultanpuri. Last edited by Baazigar; 12-25-2009 at 06:54 AM. Shammi Kapoor hero-worshipped him, Dilip Kumar was grateful that "Rafi saab sang with so much emotion, that it lightened the burden on the actor during song sequences". 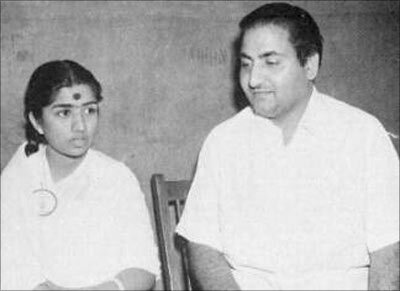 On the evening of July 31, 1980, after recording a song for the J. Om Prakash film, Aas Paas, Mohammad Rafi asked music directors Laxmikant-Pyarelal if he could leave for home. This was an unusual request because Rafi was always the last to leave the recording session. Hours later, he suffered a heart attack and died. Thus ended the remarkable 39-year career of the most famous and versatile playback singer of Hindi cinema that had generated a mind-blowing 25,000-odd songs. Rafi gave his melodious voice to hit and flop films, famous and ordinary music directors, best and worst actors. But he sang with the same gusto for all of them and it was no surprise that less talented actors like Joy Mukherjee and Biswajeet enjoyed an occasional hit film because of Rafi's songs. In the bitchy, backbiting film industry he remained above controversy, doing his work quietly, with dignity and attributing his success and fame to Allah. He had one minor disagreement with Lata Mangeshkar (she had several with stars, music directors and fellow playback singers) over some royalty issue. They did not sing together for some time. But he just shrugged it off and did not speak about it. In fact, he spoke very little. Says Ameen Sayani, well-known broadcaster and music buff, "It was impossible to make him talk. He would not give interviews and was not comfortable talking about his profession where he was the greatest." Music directors fell over one another in praising Rafi's dedication, greatness and more important, versatility. "Give him a ghazal, a bhajan, a qawwali, a soft solo or a boisterous masti number... Mohammad Rafi would put his heart and soul into it," observed veteran music director Naushad, who was among those who gave a break to Rafi in the early 1940s. It was Naushad who discovered the singer's potential for higher notes. 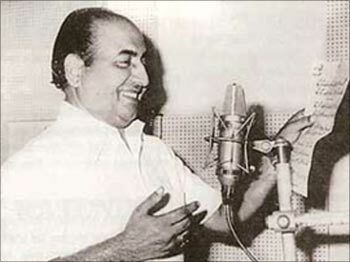 Early in his career, in films such as Dillagi, Mela and Anmol Ghadi, Rafi handled a number of popular songs in lower notes. Recollects Naushad, "Rafi saab had tremendous potential for the higher notes too and I used this talent of his in films like Deedar, Amar, Uran Khatola and most important, Baiju Bawara." Today, Rafi is more remembered for songs of this kind and no Rafi album is complete without Meri kahani bhoolnewale, Insaaaf ka mandir hain yeh Bhagwan ka ghar hain and O duniya ke rakhwale... 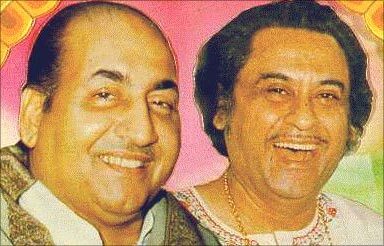 Such versatility was possible because Rafi, the youngest of five brothers from an Amritsar family, despite parental objections, learnt classical music from Ustad Wahid Ali Khan and later Ustad Barkhat Ali Khan. At a K.L. Saigal concert in Lahore, the power failed and Rafi, then 17, was roped in to sing a couple of songs to keep the restive audience quiet. Music director Shyam Sunder, who was in the audience, was impressed. Rafi got his first break in Hindi films in a Shyam Sunder film and his dream of working with Saigal was realised when Naushad gave him two lines to sing in the Saigal film, Shahjahan. The Rafi-Naushad combination clicked in the 1946 hits, Anmol Ghadi and Jugnu where his duet with Noor Jehan, Yahan badla wafa ka... became the rage. This was the first time Rafi sang for Dilip Kumar. His popularity soared when he sang the immortal Husanlal Bhagatram tribute to Gandhiji after his assassination, Suno suno ae duniyawalon Bapuji ki amar kahani. But the competition in those days was stiff. Raj Kapoor depended on Mukesh, Talat Mahmood was the preferred choice for Dilip Kumar and the classical songs went to Manna Dey. Yet Rafi created an impact with hit numbers in the films he sang. In 1952, Baiju Bawara became a major turning point in his career and thereafter, the famous Naushad-Dilip combination opted for Rafi. This was the beginning of the golden era for Rafi, and he was now wooed by all music directors. S.D. Burman opted for Kishore Kumar to sing lively romantic songs for Dev Anand, but when it came to soulful melodies, such as Tere mere sapne, ab ek rang hain in Guide, he turned to Rafi. And believe it not, O.P. Nayyar chose Rafi to sing a classical number for Kishore Kumar in Raagini (Man moraa baawara). Rafi did not mind singing for heroes, villains or comedians, as long as the songs were melodious and suited the situation. Some of his best songs were pictured on comedians such as Johny Walker (Pyaasa and Naya Daur) and Mehmood. He had a special rapport with top heroes such as Dilip Kumar. "Rafi saab sang with so much emotion, that it lightened the burden on the actor during song sequences," observed the thespian. Shammi Kapoor hero-worshipped Rafi, who first sang for him in the musical, Shama Parwana. "He was responsible for my success as the rebel star and dashing romantic hero," recalls Kapoor. "Often Rafi saab instructed me on how I should perform in song sequences. During the shooting of Kashmir Ki Kali, I wanted to repeat the first lines of the theme song at the end of the number to create an impact. Rafi saab backed me and finally music director O.P. Nayyar agreed. "Such was the rapport between us that even if I was absent during some of the song recordings, nothing went wrong." At the same time, Rafi was aware of the fickleness of the industry and when he was eclipsed by the Kishore Kumar euphoria following the Aradhana days in the early 1970s, he did not show his hurt. That was the time when every musical director and star ran after Kishore Kumar. But Rafi was unperturbed and his dedication remained the same. Once while running a high temperature he recorded five songs in a day for Laxmikant-Pyarelal! Recalls Pyarelal, "He would bring thermos jugs filled with special tea spiced with almond, pista and elaichi, and pour out cups for us during recording. I never saw him in a bad mood." The gentleman that he was, he conveniently `forgot' to remind producers for dues when a film did not do well. Rafi did not want his sons in the show business because he knew that singing talent cannot be inherited. He must have witnessed the struggles of Nitin Mukesh or Khalid Mahmood, sons of his colleagues Mukesh and Talat Mahmood. He gave his sons a sound education and set them up in business enterprises. Twenty-five years after his death, some of his best songs continue to haunt music rasikas. 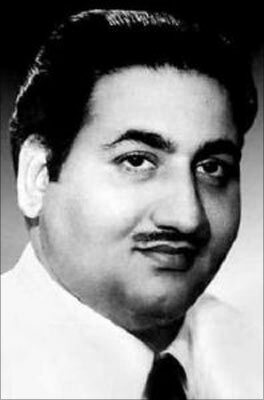 wowwwwwwwwwwwwww.... the real legend.....magical sound nu udaayayirunnu rafi sahab.. Please discuss about your favorite songs from Rafi saab, share more information you may have about this legend and enrich this thread. In 100 seconds we can tell 100 songs and almost impossible to choose the most favourite. Tum bin jaoon kahan - the sad version - ultimate - less popular due to "politics"